Three months ago, as we were nearing completion of an alpha version of our game building software, Buildbox, I started working on gameplay presets. 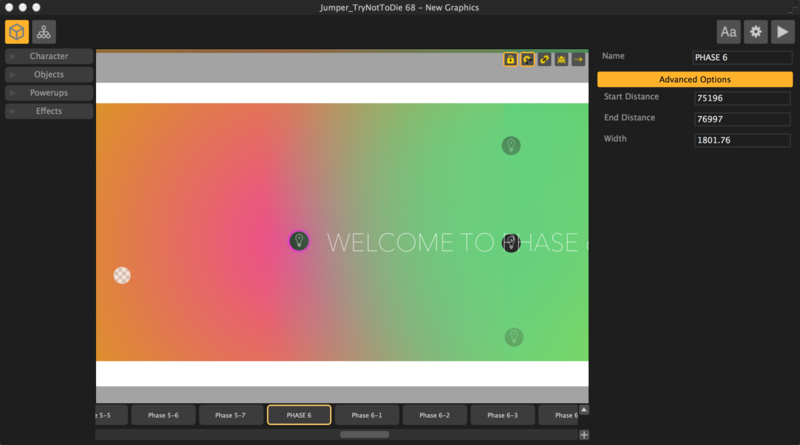 The preset was going to be a very simple jumping game similar to Doodle Jump. Since it was my first time playing with a near completed version of our software, I went a little crazy, and Phases was born. Phases turned into a bit of an obsession and also pushed Buildbox to new heights. I created the game in only two weeks, but those two weeks were insanely hectic. As I was working on the game I would find bugs or small features and the development team would add them to Buildbox in real time. It turned into a 14 day hack-a-thon and I don’t think anyone slept much, but the end result not only made a really cool game, but some really cool software too. We had no clue the game would be so popular, hitting the top of the app store and #1 on Steam Greenlight. Pretty amazing and a bit mind blowing for us. Hey guys, not at the moment. Hi Trey, Incredible Stuff. I was wondering if you had ever considered an affiliate program for the promotion of the software.